At a recent three-day workshop in Bintuni, Papua Barat, communities affected by the Tangguh gas operation demanded that BP and the Indonesian government listen to their concerns and enable them to have a say over their lives, their livelihoods and the future of Bintuni Bay. During his state visit to the UK in November 2012, Indonesia’s President Susilo Bambang Yudhoyono received an honorary knighthood from the Queen in recognition of closer ties between the two countries. The President also signed a string of agreements on trade, defence and education while in the UK. Most notable amongst these was a deal worth US$12.1 billion to expand production at BP's gas extraction and liquefied natural gas (LNG) processing operations in Bintuni Bay, Papua Barat province (see box for more details). More recently, President SBY was wined and dined by another European government and another agreement relating to natural resource exploitation in Papua Barat province was signed. German industrial giant Ferrostaal is to build a US$ 2 billion petrochemical processing plant in Bintuni Bay, using Tangguh gas as feedstock. Last year, an initial agreement to develop a petrochemical plant in Bintuni Bay was signed with LG of South Korea. Developing the oil and gas sector in Papua Barat is part of Indonesia’s Masterplan for the Acceleration and Expansion of Indonesia Economic Development, (MP3EI) – a central government initiative which has drawn criticism for all but ignoring social and environmental sustainability and climate change concerns. In Papua Barat at least, it appears that MP3EI is gathering pace. Local communities whose customary lands and resources are targeted for such schemes are struggling to comprehend what is happening to their region and to get their voices heard. They have seen outsiders exploit the local timber resources for many years now, but this latest wave of exploitation appears to be on a different scale entirely. Community concerns about Tangguh were raised at a three-day workshop held in the small town of Bintuni, Papua Barat, from November 21st-23rd, 2012. The workshop was titled “Managing natural resources in a just way and respecting the rights of indigenous communities under Special Autonomy”. Given the context of increasing resource exploitation in Bintuni Bay, it was not surprising that local community representatives approached the workshop with some scepticism. It was clear that participants were fed up with hearing about promises and initiatives that lead nowhere except to pave the way for more incursions into their lives. The workshop was built around a discussion with the communities living in Bintuni Bay of DTE’s report “Tangguh, BP and International Standards. BP’s gas extraction and liquefaction project is located on the southern shore of the Bay, while Bintuni, the closest town, is on the northern shore. However, it was clear from the start that the communities’ overriding priority was to make the most of an opportunity to meet and discuss the impacts of this project and other developments affecting them. 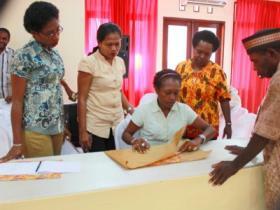 On the final day of the workshop, the discussion was extended to include BP staff and local government representatives. 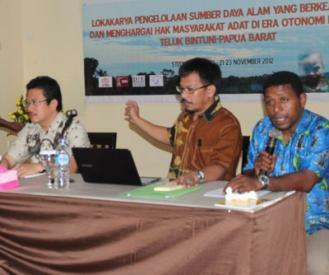 The Manokwari-based human rights organisation LP3BH and the Papua Barat NGO Advocacy Network were the lead workshop organisers,, while facilitation was shared between LP3BH, a Bintuni community organisation called Bin Madag Hom, and DTE. The sessions were attended by around 70 community representatives from villages and representatives of local women’s, inter-faith and youth groups from the North and South shore communities, all of whom have been affected by the Tangguh development. It was the first workshop of its kind to be organised by NGOs for these communities, in which participants could speak openly, on an equal footing with company and government representatives. The communities also said they were not happy about outsiders getting good jobs at the project while the local people only get menial, casual work. The impact on access to fishing grounds was a serious concern and, for some communities on the south shore, the dislocation they felt by being displaced by BP's LNG processing plant. Behind all this, was an awareness that the lives of people living in Bintuni Bay were changing due to forces beyond their control, and that these changes would lead to a future that showed no sign of bringing an improved standard of living. As an example of this, participants cited the lack of electricity in Bintuni District, which had been one of the promises made to communities. On the second day, there was a discussion of the content of DTE’s report – a compilation of the social, human rights and environmental commitments made by the Tangguh project. The majority of participants were not aware of the key BP documents setting out the social and environmental standards for the Tangguh project development, presented by DTE. Communities had given their opinions to the company - mostly their wishes to improve their living conditions - during the Amdal (Environmental Impact Assessment) process at the start of the project, and had been waiting to see their aspirations fulfilled. Participants were also interested to learn about BP's global operations and the profit the company makes. The stark contrast between the earning power of the company and the standard of living of the local people who have been exposed to this ‘partial modernity’ by the company, added to their sense of unfair treatment. At the request of the local communities and Papuan CSOs organising the workshop, the final day included a meeting with representatives from BP and the local government planning department (Bappeda). The discussion was very frank and community participants were openly critical both of BP’s record and that of Bappeda. This gave an indication of the strength of feeling generated by the unequal relationship between local communities and the powerful institutions and business exploiting the natural resources of Bintuni Bay. The workshop resulted in a series of recommendations to BP and local government (see recommendations). The dialogue process between community and BP representatives established during the workshop was taken further at a TIAP (Tangguh Independent Advisory Panel) meeting held in Jakarta a couple of weeks after the workshop. The workshop recommendations were formally presented both to BP and the local government representative, as well as being conveyed to the TIAP panel by representatives of LP3BH. The expansion of BP Tangguh, which was formally agreed in London, involves building a third 'production train' which is planned to be fully operational by 2018. This will increase the production capacity at the Tangguh plant by 3.8 million tonnes of LNG per annum to a total of 11.4 mtpa. As part of the deal for this third train, a significant proportion of the gas will go to the domestic market in Indonesia via the state electricity company PT. PLN as well as feeding the proposed petrochemical plant (see main text). CNOOC Ltd. (13.9%), Japan’s Nippon Oil Exploration (Berau) Ltd., (12.23%), Japan’s KG Berau/KG Wiriagar (10%), LNG Japan Corporation (7.35%) and Australia-based Talisman (3.06%). It is clear from the community concerns raised at the workshop that over the life of Tangguh so far BP has not been able to adequately address the impacts of its current operations in Bintuni Bay. Now it is expanding Tangguh and this is likely to bring even bigger impacts. Concerns have been repeatedly raised by civil society in Papua, Indonesia and internationally and now local communities have conveyed their own concerns directly to the company and local government. In the last few years, BP has been forced to acknowledge negative impacts of its operations in other parts of the world: following the Deepwater Horizon explosion and oil spill disaster in the USA, BP currently estimates US$ 42 billion in clean-up and compensation costs. 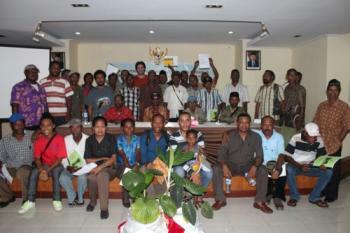 It remains to be seen how BP will respond to community demands for accountability in Papua Barat. The following document was drafted at the Bintuni workshop by community participants and handed to BP and the local government representative on the final day. There needs to be transparency and a pro-people approach by the executive and legislative branches of the regional government. There needs to be openness and transparency on the part of the Regional Government (executive and legislative) about the activities of BP Tangguh which relate to the distribution of oil and gas revenues to the indigenous communities. The Regional Government should encourage the adoption of regional legislation on the distribution of oil and gas revenues as a matter of urgency. The regional government should immediately review the recruitment system for local and non local workers, which is not in line with the decisions in the AMDAL (Environmental Impact Assessment). The Regional Government must form a Regional Information Commission. This forum requests that BP Tangguh reviews its AMDAL (Environmental Impact Assessment). To date, the non-physical aspects of development undertaken by BP Tangguh covering education, health and home economics (family-based economic activities) has not fulfilled what was promised. BP Tangguh should immediately step up the community development programme. This forum requests that the Government and BP Tangguh Management bring BP Tangguh President (William Lin) to meet directly with the seven indigenous communities in Bintuni Bay District; alternatively, that the government and BP Tangguh facilitates the seven communities to meet directly with the BP Tangguh President in the UK. 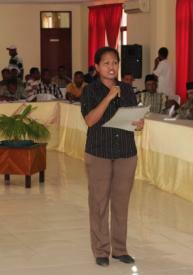 We expect BP Tangguh to conduct workshops like this one every year in Bintuni Bay District. The company must openly provide information to the indigenous communities, the wider community and the government on every policy decision it makes regarding exploration. See ‘Big Plans for Papua’ in DTE 91-92, May 2012. See 'Big Plans for Papua’, as above. The development of the Tangguh project involved the relocation of a whole village to make way for the LNG processing plant. BP built a new resettlement village for the displaced community displaced by the LNG plant which was officially 'opened' in 2004. See Tangguh, BP and International Standards, April 2011. See: The Financial Times, Nov 1, 2012. 'BP wins approval for Tangguh expansion'. See: The Guardian, Feb 22, 2013. 'BP and government lawyers prepare for battle over environmental cost of spill'.